Safely piloting a helicopter requires a very high degree of piloting skill. Up until now, flying a helicopter has been one of the ultimate challenges in the aviation world. 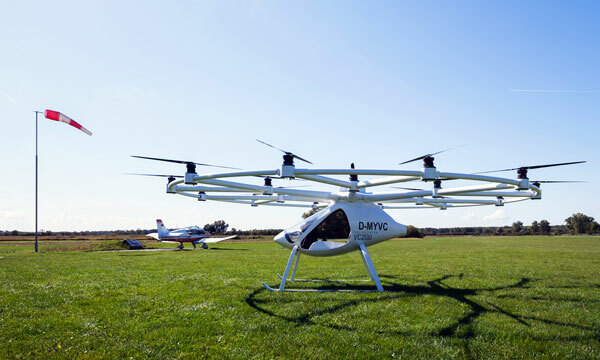 Karlsruhe-based company e-volo GmbH recently finished its first easy-to-fly helicopter, the 2-seater Volocopter VC200, and performed test flights in the open. In the process, the company’s CEO Alex Zosel remotely flew the Volocopter for the first time – single-handed and only with a joystick. Zosel himself is extremely impressed by how easily and intuitively the VC200 is operated. In the course of a November test-flight program, comprising of multiple unmanned flights with the VC200 on the airfield adjacent to the company work shop, e-volo was able to extensively test various technical innovations that don’t exist in conventional helicopters. The e-volo team was able to put the automatic altitude control, position hold, and landing systems into operation. These enable the Volocopter to stay in one position accurately and automatically, even in turbulence or crosswinds. To land, the pilot only needs to operate the altitude control. The Volocopter will descend towards the ground, automatically slowing when close, until it touches down softly. As soon as all requirements of the responsible aviation authorities are fulfilled, first manned flights will follow shortly. A video of the flights as well as an outlook on a potential future product portfolio, which consists of unmanned cargo drones in addition to a 1 and 2-seater, can be found on the e-volo homepage. In the video, the pilot lets go of the joystick, puts his hands up in the air, and the Volocopter remains in the same place. To land, the pilot only presses down on the altitude control. The helicopter lands completely automatically and very smoothly. The Volocopter was flown with an additional load of 120 kg on the seats to simulate the weight of the pilot.